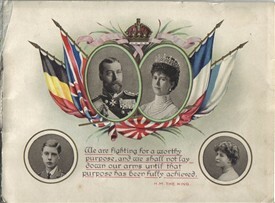 Front cover of the 1914 booklet. The document you can access by clicking on the 'Downloads' link below is a booklet, printed in 1914, by Thomas Forman & Sons of Nottingham. Containing stirring and appreciative messages from the 'great and good' of the county - the Duke of Portland, Mayors of principal towns etc - it is believed to have been sent out at Christmas 1914 to the families of Nottinghamshire soldiers serving on the Western Front in France and Belgium. (The assumption that it was sent to the families at home, rather than the servicemen themselves, is suggested by the fine condition of the booklet; if it had been kept by a soldier in the trenches it is likely to be in a much more battered condition!). The scan of the booklet you see here was emailed to OurNottinghamshire by Mrs Christine Hasman, and was originally sent in 1914 to her great grandmother, Mrs Harriet Smith (nee Bradley) of St.Anns in Nottingham. Originally from the Black Country, Mrs Smith had been widdowed in 1901, moving to Nottingham (reason unknown) sometime thereafter. The streets in which she and her family are recorded as living - Hunt Street and Flewitt Street in St.Anns - were demolished in the 1970s and 80s. Mrs Smith had two sons serving in Belgium and France during the First World War - Albert and Wilfred. The only information we have (so far) about their service is from a number of surviving postcards sent home to Nottingham. These, however, were censored by the War Office and reveal little. Interestingly, however, both brothers do quite often refer to the "tedium of active service". Mrs Harriet Smith remained living in St.Anns until about 1917, moving ultimately to the Alfreton area of Derbyshire. To date we are not aware of any other surviving examples of this booklet, but if you can add any further information about its origin and purpose, please leave a message via the 'Comments' link below. This page was added by Website Administrator on 27/10/2011.